Blog by Dr Debbie Hopkins (Centre on Innovation and Energy Demand, Transport Studies Unit, University of Oxford). 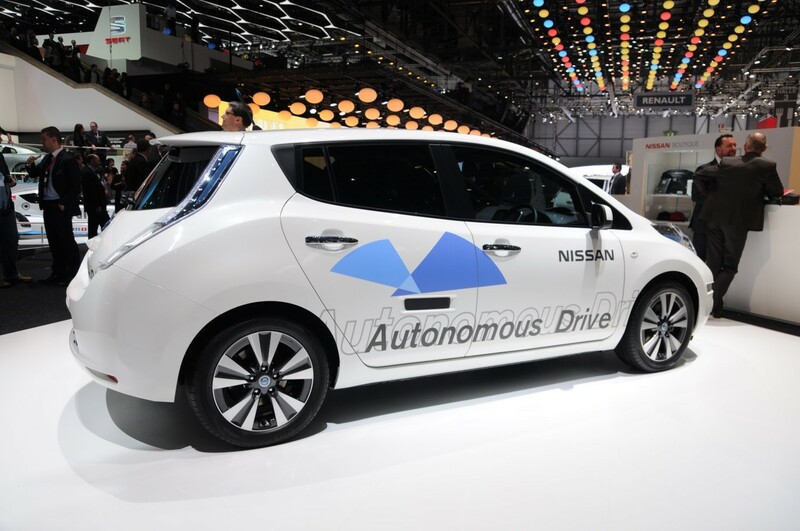 Nissan Autonomous Drive Vehicle. Image by Norbert Aepli. Shared under Creative Commons Attribution 3.0 Unported license. There is a great deal of excitement about the potential of driverless vehicles (also called self-driving, autonomous, connected and autonomous (CAV)) to contribute to a safer, cleaner, and more efficient and equitable transport system. New entrant (e.g. Tesla) and incumbent (e.g. Volvo) vehicle manufacturers, mainstream news media, the government and even the Queen are all leading discussions of the UKâs role in the design, development, demonstration, manufacturing, and use of driverless technologies. With the international driverless vehicle market currently growing at 16% a year and a suggested value of Â£900bn by 2025, the UK government is eager to be a key player. Moreover, in a post-Brexit context, automation and robotics are central to the stimulation of domestic industry, articulated in the 2017 Industrial Strategy. The government has undertaken a range of steps to help stimulate domestic innovation, and nurture an environment conducive for on-road trials. This has included reviewing road rules and regulations, funding research, and establishing the Centre on Connected and Autonomous Vehicles. This culminated in the new Automated and Electric Vehicle Bill announced by the Queen at the 2017 State Opening of Parliament. The Bill is designed to âallow innovation to flourish and ensure the next wave of self-driving technology is invented, designed and operated safely in the UKâ. Public demonstrations and trials have been central to the emergence of driverless vehicles in the UK, and elsewhere (e.g. Germany, Norway, USA). Such demonstrations are increasingly focused on the implications of automated technologies on infrastructure (e.g. transport, ICT), insurance, user behaviour, policy and regulation. Since the first wave of demonstration projects in 2015, trials have grown in spatial scale(s), the variety of technologies tested and empirical focus. Despite current hype around the novelty of driverless innovations and their ability to radically alter the current system of mobility, driverless technology has a relatively long history. Since the rise of private vehicle ownership in the 1920s there has been interest in innovations that reduce or remove the role of humans from the driving task. Predictions of contemporary transport concerns (including congestion) motivated a rethink of the role of human drivers in the system of motorised transport. Yet for a variety of social, economic and technological reasons, support for trials and demonstrations eventually weakened, until recent developments in deep machine learning and other (groups of) âsmartâ technologies enabled new forms of driverless technologies to emerge. A range of categorisations have been developed to enable technological and policy understanding of automation. The National Highway Traffic Safety Administration (NHTSA), the Society of Automotive Engineers (SAE) and Bundesanstalt fÃ¼r StraÃenwesen (BASt) have each developed ways of framing degrees of automation which distinguish between vehicles which largely rely on human control (SAE levels 0-1), to those which are to a large degree (SAE level 4) or completely (SAE level 5) operated by a machine (Fig. 2). There is a commonality across the definitions, each articulating a distinct set of roles for the human driver, and for the machine(s). Source: Authorâs own depiction of SAE levels of automation from a human driver perspective. The SAE levels, while not without problems, are useful for signalling the various stages of automation, and help us to understand the automated features in contemporary vehicles. Features including lane assist, park assist, and area view are becoming increasingly common in new vehicles. The key word here is âassistâ, where automated features are currently assisting the human driver, who has responsibility for the driving task. As the automated capabilities increase, the responsibility incrementally shifts from the human to the machine. Yet the spate Tesla Autopilot collisions have pointed to public and industry confusion in interpreting the degrees of automation and fully articulating their capabilities âon the roadsâ and in real-world settings. Nevertheless, in the public sphere, awareness and knowledge about automated technologies and degrees of assistance is growing. This is playing out in new car advertisements with the promotion and normalisation of driverless âassistanceâ innovations. For instance, the 2016 Volkswagen Tiguan advert titled âParents, Take Noteâ depicts parents and teenagers at the school gate as the driver of the Volkswagen Tiguan lifts his hands from the steering wheel as the vehicle parks itself in front of the school, to the awe of those watching. Powerful and vocal actors are enthusiastically supporting the development and testing of various levels of automated technologies and full driverless vehicles (SAE level 5) in the UK. Yet replacing current vehicles for automated vehicles is unlikely to result in the claimed energy, safety, efficiency, and equity benefits. It is critical that discussions of automation broaden to include consideration of ownership models, and the potential for shared mobility, alternative fuels, infrastructures, urban form, and user practices. This blog draws on the work of the âThe energy implications of automated and smart freight mobility‘ project. For further reading please see: Hopkins, D. & Schwanen, T. (2018). Governing the race to automation. In: Marsden, G. and Reardon, L. (Eds.) Governance of Smart Mobility. Emerald, Bingley, UK.